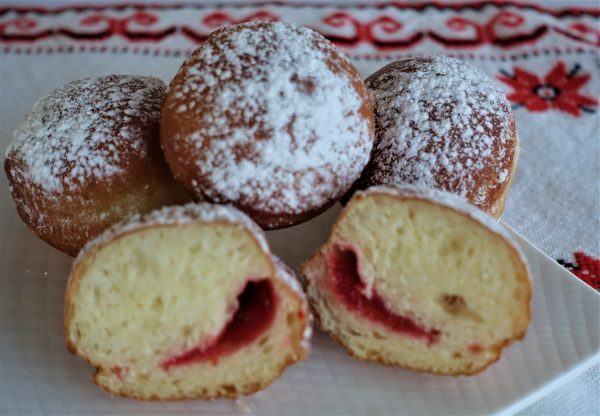 My mom made the best homemade doughnuts (Pampushky in Ukrainian, or Paczki in Polish), using her European recipe. Hers are so much better than the quick recipe I used before. Every Christmas Eve my mom joined us for dinner, and always brought in a huge platter of freshly made doughnuts. We all are still reminiscing about those sweet memories…. Today I will share that recipe with you all, in memory of my mom’s baking and cooking. 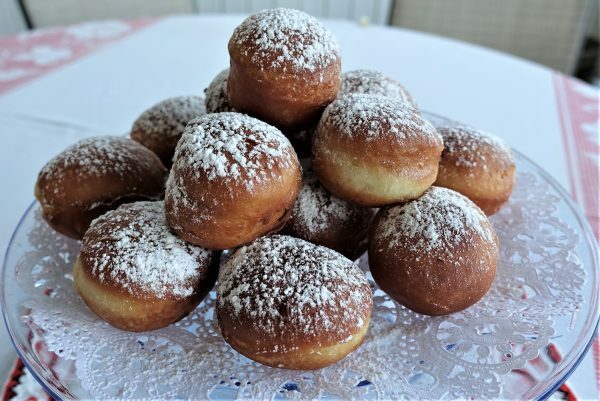 She made them larger, by using a 3 inch doughnut cutter, and would use more filling, or leave them plain, without filling. I prefer to make smaller ones (using 1.75 inch cutter), especially if I plan to have other baked goods to sample. This is how you mark the outline of the doughnuts and place filling, before folding over the other half of the dough, to cover the filling, and to get ready for cutting them out. I use a doughnut cutter, but my mom used a water glass, this way the edge was not as sharp, and the dough was pressed together a little firmer. If you decide to make larger doughnuts, you will use more filling, hence might need 2 cans of the filling. 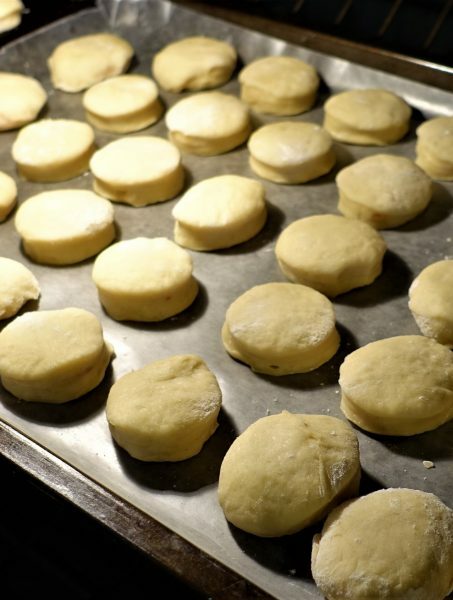 Solo Pastry Filling is the best one to use, as other jams will bubble during frying, and boil out of the doughnuts. In Europe they have a special sweet spread used for baking, or make their own from various fruits, or sauteed wild rose petals and sugar…so delicious and such a pleasant fragrance. 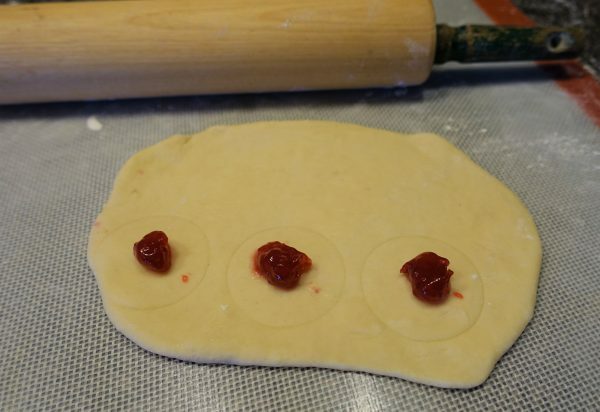 These doughnuts are all ready to be cut out, with the filling enclosed between the two sheets of dough. Doughnuts are placed on a pan lined with wax paper, or parchment paper, lightly floured, and kept in a warm place to rise before frying. The better they rise, the lighter they will be in texture. Proof the yeast, by mixing 2 Tbs. of warm water, 1 Tbs. granulated sugar and 1 packet of yeast. Keep it in a warm place until bubbly. Mix flour with sugar and set aside. Add the warm milk to the melted butter, and mix gently into the beaten eggs. Add vanilla extract and vodka to the egg mixture. Incorporate the proofed yeast into this mixture. In a large mixing bowl, mix wet ingredients with dry ingredients, to form a sticky dough. Using a dough hook, knead the dough for 20 minutes, or longer, until a soft dough is formed and does not stick to the sides of the bowl. Grease a large bowl, and place the dough in it, turning it over once, to grease both sides. Cover the bowl with a tea towel, keep it in a warm place to double in bulk (I warm the oven to 120 degrees F, turn off the heat, and keep the covered dough to rise until double in bulk...1-2 hrs). Punch it down, and let it rise again. Remove 1/4 of the dough from the bowl onto a lightly floured work area, and roll out into a rectangle 1/4 inch thick. Temporarily fold over the dough in half, then unfold, just to see the fold line in the dough, to serve as a guide for doughnut circles and filling. Using a doughnut cutter, gently press onto the half of the dough to mark the doughnuts circles, not to cut through the dough. Using a teaspoon, place about 1/4 tsp of filling in the center of each circle, then cover over with the second half of the dough. 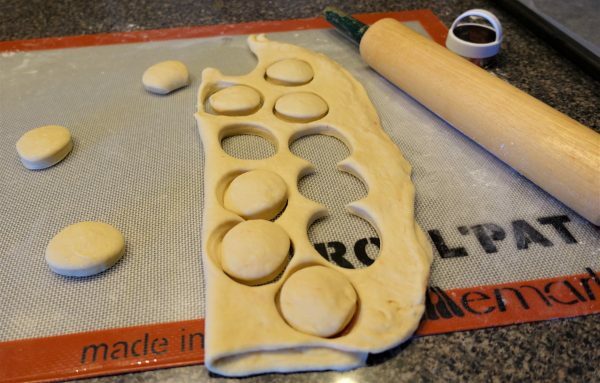 Using the cutter, cut out doughnuts around the filling bumps protruding from under the top sheet of dough. Place the doughnuts on a baking sheet covered with tea towel, wax or parchment paper, lightly floured, so they don't stick to the liner. Place the pan in a warm place...I use the oven as for the dough, and let them rise. Work with the remaining dough until all used up. Place a large and deep sauce pan on the stove, place 4 cups of Crisco shortening into the pan (need enough melted shortening, so the doughnuts flat freely in it), and heat it to 375 degrees F (a deep fry thermometer is very helpful for success). If you don't have a thermometer, you can keep the heat on medium and test the oil heat by dropping a piece of dough into it, and if it sizzles, the oil is ready. Too hot oil will burn the outside crust of the doughnut, leaving the middle uncooked. Drop in enough doughnuts to fit the diameter of the pot, without overcrowding them. Fry couple of minutes on one side, until golden, then turn them over, and fry to amber color on both sides. Remove with a slotted spoon, and place each on a plate lined with paper towels, to absorb excess oil. Cool slightly. Sprinkle with powdered sugar before serving. For best results, serve them fresh. Leftover doughnuts may be warmed up gently in a microwave just before serving, then sprinkled with powdered sugar. Also suitable for freezing, after fried, cooled completely, wrapped in paper towel, then in plastic freezer bag, then in foil paper, and should be used within 3 months.